If you want to use your iPad for real work and not just for streaming Netflix and playing games, you’re going to need a decent keyboard. You’ll never be as productive without one as you will if you have a physical keyboard to type on. Definitely check out the Yekbee iPad Keyboard Case. It’s an Amazon best-seller that’s compatible with the 6th-gen iPhone, 5th-gen iPad, 9.7-inch iPad Pro, iPad Air, and iPad Air 2, and it’s on sale for just $65 right now. 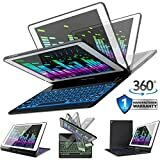 #1 BEST SELLING KEYBOARD CASE ON AMAZON.COM: A stylish finish with grip-enhancing tech & smart business-grade protection make our high-quality hard clamshell case uniquely ideal for home, work & travel. The quiet keyboard’s spacious layout & 7 backlight colors provide the freedom to read, browse & work anywhere at any time. The case is compatible with the latest 2018 iPad 6 (A1893-A1954), 2017 iPad 5 (A1822-A1823), iPad Pro 9.7 (A1675-A1674-A1673), iPad Air 2 (A1566-A1567) & Air (A1474-A1475). 360 REASONS TO SMILE: Rotate the screen 360 degrees to effortlessly display your work presentation, watch your favorite show or read a new book while you enjoy your iPad a little more, even when you’re out and about! Whether you’re a blogger, writer, designer, professional or student, the Yekbee iPad keyboard case offers you a smart, stylish and practical solution to your everyday needs. The simple and elegant style makes it great for any accessory combo as well (stylus holder & more!). SMART PROTECTION: Auto/sleep wake protects and conserves battery life while the durable polycarbonate shell with impact-resistant corners and reinforced aluminum hinge protects the rest. All 9.7 inches of your retina display are further protected by durable, 10,000,000 stroke-certified keys. The keyboard arrives in a premium hardshell, gift-ready box and includes an external USB charging cable and, our highly-praised product manual (with full-color photos!) that makes setup a breeze. ULTRASLIM DESIGN: Combining our industry-leading keyboard design and adding more spacious chiclet keys means a more satisfying and tactile typing experience for you. With productivity maximized touch typists rejoice! The ultra-thin case is lightweight, portable, & guaranteed to get complements.